Borlase Smart, quite rightly referred to by the author Marion Whybrow as a "Man of Vision", certainly was progressive in his outlook on art. The article below, from September 1946 is an excellent example of his vision and readiness to accept and encourage emerging talent. The five young artists mentioned will be well known to most of us, they (with the exception of Bryan Winter) were among the 19 artists who broke away from the St Ives Society and founded The Penwith Society of Arts in 1949. 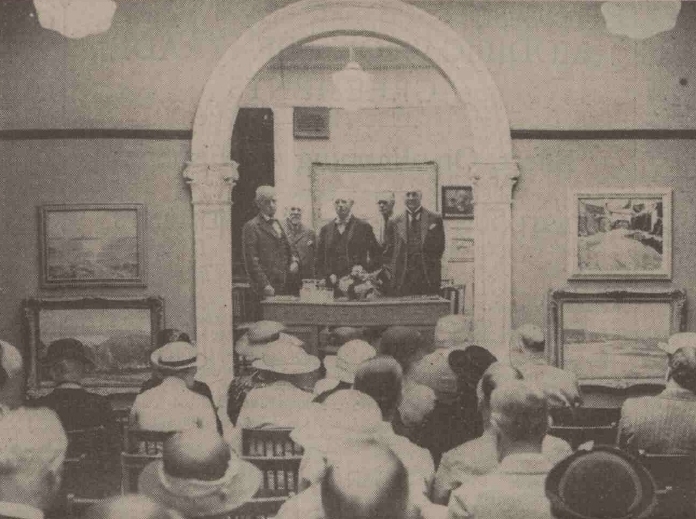 St Ives artists were often featured in exhibitions at Harris & Sons Galleries in Plymouth. Pictured below in June 1936 are (left to right) Terrick John Williams R.A., Henry Vigurs Harris, Moffat Lindner (President of STISA), Capt. Robert Borlase Smart (Secretary of STISA) and Sir William Munday. NB: A portrait of Henry Vigurs Harris, by Stanhope Alexander Forbes, is in the Plymouth City Council collection.